We’ve all been there – standing at the front door in the rain, rummaging for elusive keys at the bottom of a brimming bag. Might it have taken the edge off a little if that standing space was dry and sheltered and there was then no need to towel dry the new hairdo? Whilst the idea of a door canopy may primarily be to look super smart and to enhance the ‘path-appeal’ of a heritage or modern, exposed doorway, the physical shielding of people (and door furniture) from the elements is a real plus point. Considering a more welcoming ambience for a restaurant, café, B&B, hotel or heritage property entrance? Garden Requisites’ aged zinc galvanised steel door canopies create an enviable entrance and, once up, unlike many cheaper plastic alternatives, will last a lifetime. Discerning customers, guests and visitors will sense the craftsmanship and care. Accompanying, complementary designs of exterior furniture will also add kudos to any hospitality or business premises. Take a look at our steel planters and troughs which include neat area-screening containers with in-built contemporary grid-design trellis, especially effective when adorned with climbing plants. Stylish and sheltering door canopies can be used for modern buildings as well as heritage properties. Gain inspiration for various styles of exterior and doorway – especially Georgian, Victorian, Edwardian and after – via our British Doorways Pinterest board. Impressive widths of our steel canopies also work well above French patio doors, as sliding or bi-folding doors and are popular for owners of barn conversions and extensions. 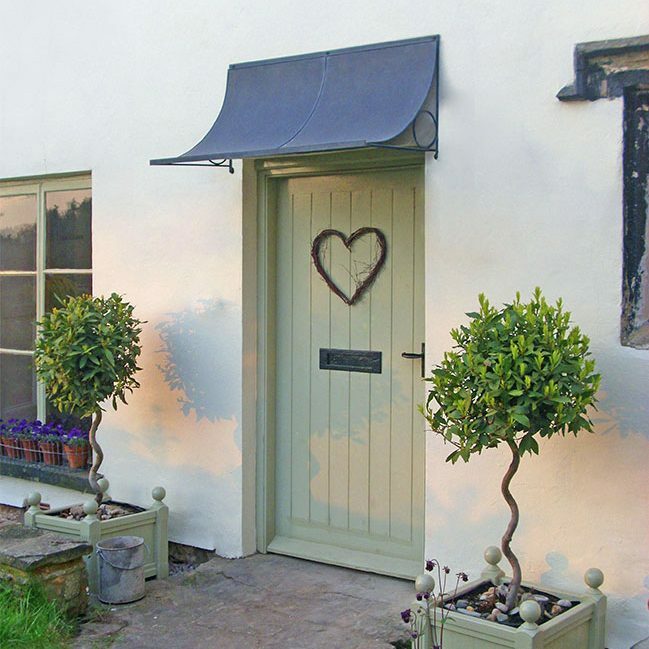 A more traditional handmade door canopy can add valuable visual interest to garden facing entrances – a pared-down, finishing touch with an air of authenticity. A variety of curved and scooped arches can be made-to-measure, lovingly hand crafted at Garden Requisites and some designs, ideal for planting pretty climbers to climb up adjacent garden trellis, incorporate our signature English wirework. For those that are lucky enough to live in countryside areas renowned for star gazing and dark skies, canopies can be installed above wall lights, or vice versa, to preserve the low levels of light pollution. To start the process of securing your own tailored door canopy, do take a look at our metal door canopy designs, choose a favourite design and give Hilary and team a call to discuss dimensions, including the wall or façade that the canopy will be fixed to. A door canopy can be modified to allow for unusual architectural features and with no fiddly self-assembly required, installation will be straightforward, with matching fixings included. We’re always ready to help advise how to choose and install the best solution.